Rah! Sis Boom Bah! Go Team! As the weather turns cool, it's time for winter sports like football, hockey and Tailgate Parties! Team up with friends and make it a potluck meal. Or if you really want to show off, make it all yourself. Keep in mind that you want foods that can be eaten out of hand or with as few utensils as possible. This keeps down the trash and clean-up factors, and won't require seating arrangements. The featured tailgate party recipes include a variety of foods suitable for a picnic in the parking lot of your favorite stadium or any picnic location, including your family room. If you decide to spike your drinks, be sure to have a designated driver and be sure it's permitted in the stadium parking lot. • Prepare foods ahead of time and have them wrapped, packed and ready to roll. 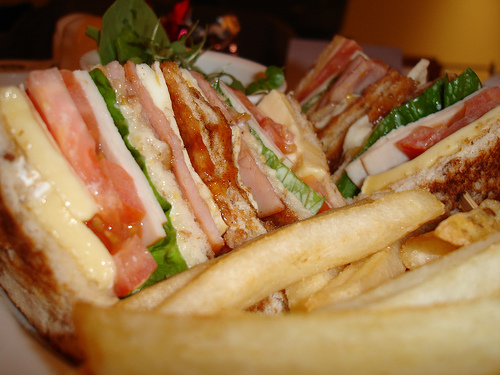 • Stick to finger foods if possible, and make sure they are in manageable pieces. • Bring along plenty of napkins, or better yet, a roll of paper towels. • If utensils are necessary, bring disposable ones, including toothpicks. • Don't forget sturdy, disposable cups for any drinks. • Bring along a tablecloth to spread your wares upon and a bag for your trash. • Warm up hot drinks just before leaving and bring along in an insulated jug. Some people just can't get enough of the great outdoors. They enjoy eating outside, no matter what the season. They find ways to overcome the cold, the wind and other atmospheric disturbances. In fact, they like it so much that they bring equipment worthy of a home or patio kitchen on their outings. Of course, what I'm describing is a tailgating party. Sporting events, college or professional, are the siren call for this group, but musical concerts are also a big lure. Tailgating is, in itself, a competitive, public spectacle. Serious tailgaters work to establish the most elaborate setting for their party. Tables, chairs, carpets and grills - all the comforts of home - are taken along for the party. Tailgaters are very serious about their food, often preparing days before the event. Select food that can either be cooked ahead and transported to the event, or cooked there on a grill. Follow food safety precautions when it comes to transporting food. Keep cold food cold (40 degrees or lower) and hot food hot (140 degrees and above) to avoid food poisoning. If you plan to bring alcoholic beverages, check with the stadium first to make sure it's permitted. Don't forget to bring bottle openers and corkscrews, if necessary. At the very minimum you'll need a large, heavy cloth on which to spread out the food. All the better if you can bring a table to go under the cloth. Pack disposable plates and cups. Who wants to do the dishes after having so much fun? Be prepared to clean up after yourself. That includes putting any leftovers you plan to keep in cold storage, throwing away your trash in available trash cans or bags that you've brought along, and safely dispose of any hot coals from your grill. Don't leave a hot grill unattended if you're heading in to the event. Bring paper towels or wet wipes to help with clean-up before, during and after your tailgate. Nacho Layer Dip - This recipe from the Food Network is a snap to prepare. Prepare it at home and transport it in an insulated food carrier. Grilled Bratwursts - Some people swear it's not a tailgate without these on the menu. 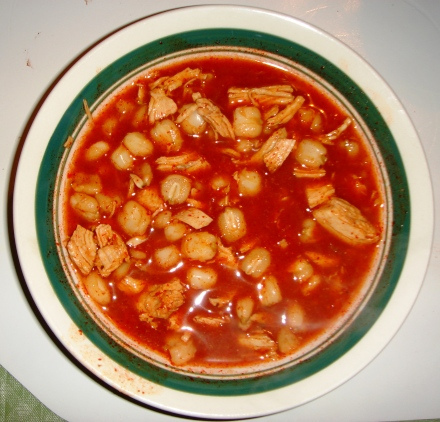 Posole - This hearty, Mexican soup should warm you up on a chilly afternoon. Picnic Potato and Egg Soup - This recipe goes well with anything you grill. Orange Shortbread Cookies - Cookies are the perfect tailgate dessert because they pack so easily. Assorted beverages including beer, wine, and soft drinks. These brats are simmered in beer making them extra juicy and filled with lots of flavor. Once grilled, drop in a bun,top with whatever you like, and you have a perfect snack for the game. In a large pot combine all ingredients except the rolls. Simmer over a low heat for 20 minutes. Preheat grill. Remove bratwursts from pot and place on grill for about 10 minutes, turning occasionally. Grill until brown. If you sprinkle with water they will form a crispy skin. Serve on rolls with your favorite mustard. A rich soup originating from the Mexican state of Jalisco. Soak dried hominy in lightly salted water overnight. Follow Nixtamal directions for cooking and soaking hominy. Only use 2 cups of dried corn to make the hominy. Heat oil in a large saucepan over medium heat. Saute the onions and garlic for approximately two minutes. Brown the meat in the pan with the onions and garlic. Add enough water to cover the meat with a least 2 inches. Stir in the dried hominy, salt, cumin, oregano, cloves, pepper and chiles. (If using fresh hominy instead of dried, do not add at this time.) Let simmer for 1 hour. Remove the meat from the liquid. Remove excess fat and cut the meat into small cubes. Set aside. This salad is delicious with just about anything grilled, and always tastes best outdoors! Top with thinly sliced tomatoes and cucumber, if desired. Traditional shortbread cookies shine with the flavor of oranges. Each of the attractive diamond-shaped cookies are topped with a slice of almond. Hint: Use a pizza cutter to quickly slice the cookies. Beat butter in a mixing bowl at medium speed of an electric mixer. Gradually add powdered sugar, beating well. Add orange rind and concentrate. Stir in flour. Press dough into a lightly greased 15- by 10- by 1-inch jellyroll pan. Prick all over with a fork. Cut into 1-1/2-inch diamonds. Place a sliced almond in center of each diamond. Bake at 300 degrees F. for 30 minutes or until done. Let cookies cool in pan on a wire rack. Combine sour cream, horseradish, honey, mustard, garlic salt, and white pepper; stir well. Place 3 ounces of ham on each of 4 slices of bread. Top each with 1 teaspoon sauce, 1 slice cheese, a lettuce leaf, and another slice of bread. Place 3 ounces of turkey on each slice, and add 1 teaspoon sauce, lettuce leaf, 2 slices tomato, and 1 slice bacon. Top with remaining slices of bread. Skewer a ripe olive and pimiento stuffed olive on each of 16 wooden picks. Cut each sandwich into 4 triangles, and secure each quarter with a pick. Combine the tomato puree, sugar, garlic, lime juice, lime zest, chile paste, and 1/2 cup of the basil in a saucepan. Dissolve the cornstarch in the water and set aside. Bring the sauce ingredients to a low boil over medium heat and cook a few minutes. Stir in the cornstarch and cook just until the sauce is thick and glossy. Remove from the heat and let cool to room temperature. Toss the cooked shrimp with the sesame oil in a mixing bowl. Sprinkle with red pepper flakes to taste. Add the cooled tomato sauce and toss to combine. Transfer to a shallow serving bowl and sprinkle with the remaining 1/4 cup basil. Garnish with lime wedges. Serve chilled or at room temperature.